There is special species of plant on this Earth. Flowers bloom from it after 80 -100 years. Thousands of flowers are sprouted at a time. Crores of seeds can be obtained from those flowers. And the plant dies after the blooming. There are some rare species of plants on the Earth which bloom after a very long time. Also there are plants which bloom after the period of 10 years. There is another extreme rare species of plant called Puya Raimondi which blooms once in 100 years and dies immediately. It has wonderful special characteristics. This plant is also called Queen of Andes. This plant can be seen only at two places in the entire world. That too they grow on the top of high hills. Puya plant grows to a height of 33 feet. It lives in unfavorable and dry conditions. It blooms after a period of 80 years to 100 years. Then thousands of small flowers are bloomed at once. Through these flowers, few crores of seeds are formed. Although it is such a hard plant it has now become a species that is nearing extinction. Queen of Andes plants grow only in the hilly areas of Peru and Bolivia countries. It grows with a single trunk vertically up just like a pillar without any leaves or branches. Moreover, these plants have the characteristic of rolling inside. It is highly difficult to keep hand in it and take out without thorns pricking the hand. Sometimes, birds step on this plants while flying and get struck in between the thorns. Sheep, Cows are wounded frequently due to the thorns of these plants. So people are angry with this plant species. They cut down and disrupt the plant as soon as they see the plants. Queen of Andes plants have got good fame as one of the wonderful, special and rare species of plants by their special characteristics. They grow on the hilly areas at an altitude of 15,000 feet from the sea level. Recent research had revealed that their population is 8 lakhs in Peru and 35 thousand in Bolivia. But Scientists have observed that these plants are going to extinct soon. That’s why officials have come forward to protect this plant species. Protection steps are being implemented. 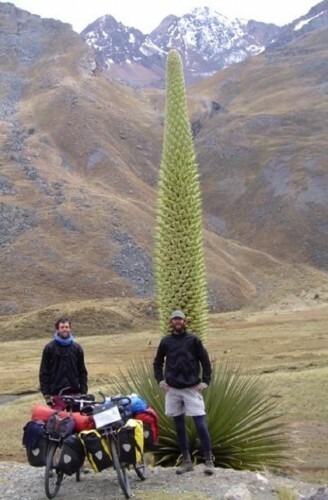 A French scientist has discovered this plant for the first time in 1830 in Peru. It was named after the great Italian scientist who did extensive research on various plants in Peru.